After breakfast at hotel, I headed to my uncle and aunt house kaypoh-ing while hubby took his own sweet time to rest in the hotel and join his Ipoh friends later for food hunting. I'm not joining him as I got a long-waited gathering with 2 mummy in the afternoon. Many of my relatives and cousins left heading back home. The mummy I was planning to meet are lovelymummy (Shirley Soo) and Mummy-in-vain (Jacelyn Chew). Me, Shirley and Jacelyn. I look a bit huge in between 2 petite mummy. Finally, we make it at 4.30pm in Indulgence. I was told that this was the most high class restaurant in Ipoh. It was a bungalow lot restaurant and boutique hotel reserving back on its own English exterior. Inside the place is cozy, quiet and very comfortable, it is definately a great place for gathering. Here, mainly they serve European cuisine and this is what I have and the price is reasonable too. The minute we sat down, it was like meeting an old friend. Since we know each other well from blogsphere, we talked non-stop for almost 2 hours and I certainly have a great moments with them. Many thanks to both of them for the tea time and Jacelyn offers to sent me back to my uncle house too. After dinner, while waiting hubby came to take us back, I got the great time playing and singing to baby Benjamin Liong. He was such a cutey and Terry love him too. 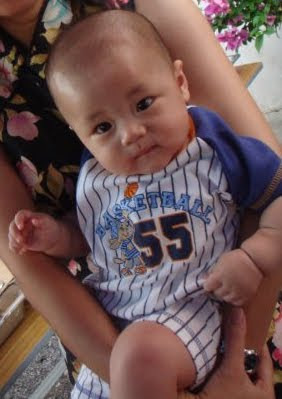 He was my cousin bro's son and so far he is the youngest in the family. The day we return to KL. Early morning at 7.30am we have light breakfast at hotel first then when my parents and others reach our place near hotel, we brought them for breakfast. Initially was thought wanted to have dim sum at Fu San. Holly moly, since they are very famous, (now the shop also bigger with 3 floors), their business too good and they got to close the gate for business for not letting many ppl go into the restaurant to wait. Eaters got to wait outside and given a number to wait for your turn. My uncle happened to eat there on chor 3 early morning. It was really terrible, too many ppl, waiters is not enough or slow, they got to self serving from taking food too. Not only that, the quality of food is bad too. Not to think too much, we find something else to eat. Ipoh for sure got many other good foods. The journey back KL is all way smooth with no jam. Hub's friend scared us that the traffic is slow and jam on 3rd day, that's why we left early. We reach KL toll gate around 12 noon. Not eating lunch, after unpack and feed the boy some yong tau fu pack from Ipoh, we have a long long nap till 8pm. The boy nap till 9pm+ have a bottle of milk then continue his sleep till the next day. To him the CNY, other than play, he has not been eating and resting well. Wow...gathering in Ipoh with Ipoh mummies..how nice. :) I heard about this Foh San restaurant from other bloggers. Seems like it's always packed with ppl.